On my 'to do' list for this weekend... make Pumpkin Cupcakes with Maple Frosting! Found this beauty, see recipe here, and I'm in! I'm not sure what will be better, the pumpkin cupcake or the maple frosting... can't wait to find out. 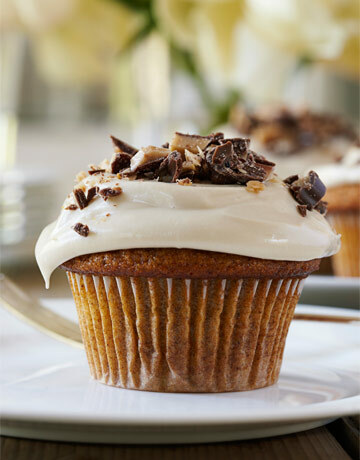 I'll post my version of this scrumptious cupcake on Monday... something tells me it won't look quiet as good as this one but I'll give it a try. Care to join me? Oh, and I hope to get out the rest of our Halloween decorations, choose costumes for the boys and buy some candy too! If you're looking for last minute Halloween decorating ideas check out Jennifer's post on Speedy Decor. HappyWeekend!! ps... don't forget, Steve & Chris today at 2pm!! Mmmm, they look so good Wendy! Have a great weekend! And looking forward to seeing the rest of your Halloween decor! mmmmm....they look (and sound) delish! I'll join you! I think these would be perfect for a nice Sunday dessert. Maybe I'll give it a try tomorrow. Thanks for the idea. Looks delicious & perfect for Autumn!